started thinking: hey, having a volume pass would be helpful for my compositing. Then I thought "can you even create a volume pass with mental ray"? Still not sure officially as there is no sign of creating a volume pass in Max's documentation anywhere. I'm sure there are other ways, but I'll show you how I create one. To create the above effect you have to use the Parti Volume shader. If you don't know how to use it check my posting on Parti Volume. To get the render to work properly, I create a black material with a diffusion, reflection, refraction all of 0.0. Then plug this material into the Material Override slot in the Process tab of the Render Settings. To get the control of the volume light itself, turn off any Indirect Illumination you may have. Also turn off your exposure. For rendering speed, you can also turn off any shadows you have on your lights. Lastly, in the Parti Volume shader settings, be sure to check the Lights box. This will only create volume light for lights that are listed in this list. You can add as many or as little lights in your scene as you like. To control the intensity / brightness of the volume in the render there are two factors. The intensity of the lights themselves, and the brightness of the Scatter color in the Parti Volume shader. With these settings, they should produce an image similar to what is above. Ok, I have my volume pass, now what do I do with it? In Photoshop, or another image editing software of your choice, open your beauty pass (the regular render) and your volume pass. Put the volume pass on-top of the beauty pass, and set the blend mode to Screen. This will force everything that is black in the image to be transparent and everything that is white to be opaque. If the volume is too subtle you can increase it by pumping up the contrast. You can also change the color of your volume with playing with the Hue/Saturation and Colorize. 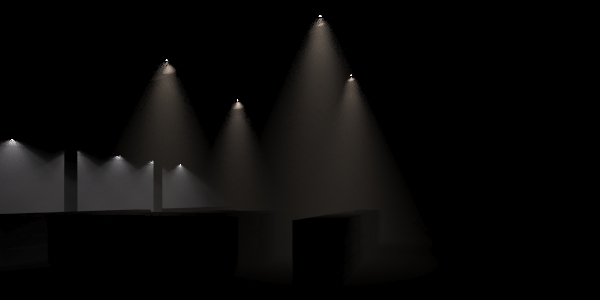 your posts about volumetric ligth where really helpful to me, but there are some remarks i want to make. when using the sun as the light for volumetric light, you should not turn shadows of, or the effect will be lost. also, i would like to know what setting u use for the best quality without increasing render time too much. Settings, I typically leave r, g1, g2 at 0, and set my min: 2', and max: 4', rendering with 1-16 global samples. A neat compositing trick is to render a volume pass at global samples of 1-1, so it renders quickly. Then in post, put a Gaussian blur on the volume pass to make it look softer...just don't blur it too much or you'll begin to lose definition. Is there some way to do this without photoshop and with mr photografic exposure control for the daylight system???? (sorry for the long text. Does parti volume work with exterior scene?? Oy, I know that it doesn't work in v-ray)) I mean that I couldn't setup it. hi, do you think the same approach to be used to create an individual light pass? 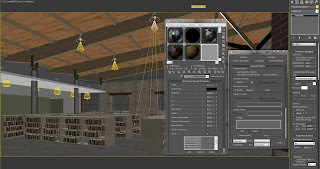 IF this will not work, do you have any idea how to create light a pass for an individual light source?